With such a huge choice of workshops out there it’s hard to know which one to opt for. 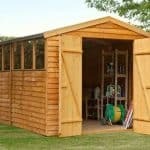 If you’re looking for an affordable, yet good quality large building then this 10’x8’ Shed-Plus pressure treated overlap workshop is a great choice. As it is designed to be used as a workshop, a different material has been used for the floor to make it a little stronger. Whilst it isn’t as strong as tongue and groove, it is more stable and solid than the OSB materials typically found in overlap buildings. 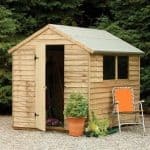 It is the pressure treated walls that really make this shed worth investing in however. When you buy an overlap shed, it typically requires strict annual treatments to ensure it doesn’t warp. However, the pressure treatment eliminates the need for annual treatments and it also extends its anti-rot warranty to 15 years rather than 10. Another good quality feature not found on most overlap buildings is the braced doors. Like most workshops of this size, double doors are included and they open out pretty wide to enable you to walk in and out with ease. You can also get all kinds of machinery and equipment through the doors without worrying about getting them stuck in the doorway. Not suitable for heavyweight storage. Adjustments can be made to strengthen the floor however. Unpainted finish might be off-putting, but this can easily be changed with a coloured treatment. This is a large workshop that has been treated for ultimate durability. It benefits from an exceptionally tall design, giving you plenty of space to move around comfortably. The door width is not as wide as most shed doors, but thanks to the double door feature, you still receive a large amount of space to manoeuvre in and out of the workshop. The depth and width of the building are fantastic and ensure you have more than enough space to work comfortably. A stylish gentle sloping apex roof gives this workshop a tall, spacious design. It also helps to protect the building from rot, directing rainfall quickly off the roof and onto the ground. The roof is constructed with OSB which is very common with overlap buildings. It is covered with a green mineral felt which complements the cladding. One of the features of the Shed-Plus overlap workshops is that the floors are created from MFP board rather than OSB. 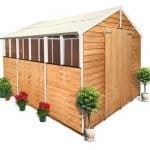 There is little difference, but it is a little tougher than OSB which makes it more suitable to be used as a workshop. It’s still worth considering adding an extra board on top just for peace of mind that it will cope with heavy machinery if required. Usually we don’t get very excited about overlap buildings. They are great value for money and reliable if treated often enough. However, compared to tongue and groove they just don’t measure up. This one however has pressure treated walls. So what does this mean? Well put simply, it means you will never have to treat the building. Even with Shiplap tongue and groove clad buildings you generally need to treat them annually. Pressure treatment is a lot more superior to a dip treatment. It consists of five different steps and doesn’t just coat the outside of the timber, but it also penetrates inside it to offer a more intricate barrier. As well as offering a maintenance free building, this treatment also extends the anti-rot warranty to 15 years. The manufacturer has also provided a more secure frame measuring 45mm x 28mm. So compared to other models out there this one is a lot more superior. We like the braced double doors included with the shed. It highlights that the manufacturer has given extra attention to detail to the smaller parts of the building. 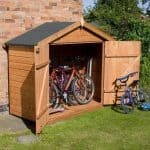 As mentioned they do have a shorter width than the doors you find on most sheds, but together they offer a great amount of width to get comfortably in and out of the workshop with bulky equipment. They have also been fitted with a strong pad bolt to keep the doors closed. There are 4 fixed windows located on the side of the workshop. These can be switched to either side thanks to its interchangeable design. They are also glazed with styrene which means they are totally shatterproof. Provided you buy a padlock, the security of this workshop is great. An alarm padlock is offered as an extra and this will guarantee whatever you keep in the building will remain safe from thieves. Unfortunately there isn’t anything you can do about the privacy issues. The 4 large windows supply a fantastic amount of light, but they also allow people to peer through and see absolutely everything inside. You cannot install any window covering as the overlap won’t support the weight. So it is advised to install the windows on the most private side of the garden. 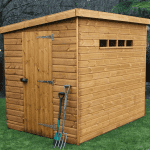 All three extras that are offered with this shed are actually pretty useful. The hooks may seem trivial, but overlap sheds are notoriously weak. You cannot hammer nails into the cladding without causing damage. So the installation of hooks and shelves isn’t recommended. The hooks supplied here however are especially designed with overlap buildings in mind. Instead of being nailed into the walls, they simply slot between the overlap panels. They won’t be able to hold anything heavy, but they can help to keep the interior more organised, as well as slightly expand its storage capacity. The doors have a pad bolt attached, but for security purposes you do need to buy your own padlock. So the two options given to you here could be considered an essential purchase. Both the alarm padlock and the Yale security kit will help to keep your storage safe. The single padlock is one of the best quality and most effective padlocks on the market. It is supplied with 3 keys and will sound a very loud alarm if somebody tries to gain access without a key. This is usually enough to deter a burglar. If you want top notch security then it may be worth paying a little more for the Yale security kit. This includes a padlock, a separate alarm system and a hasp and staple. Lastly you have a solar light. Now the windows of the building will provide a good amount of light during the day, but on darker afternoons or at night, the solar panel will help you to retrieve your storage without the need for a flashlight. What we love about this solar light is that it is very affordable and it comes with a remote solar panel that charges it up throughout the day. It incurs no running costs and does not need to be fitted to the mains. It isn’t often we give an overlap shed 10/10 for quality. However, the manufacturer has gone above and beyond to make sure you are getting an excellent quality building. Another top rating that you wouldn’t expect from an overlap shed. The fact it offers a 15 year anti-rot guarantee and it requires absolutely no treatments makes this one of the most outstanding quality buildings on the market. Being a large workshop, you are given exceptional interior space. It is capable of storing a large selection of equipment, tools and even machinery if you strengthen the floor. 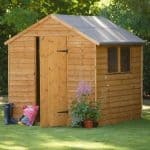 There is one thing that most customers find difficult with the installation of this shed and that is the roof. Due to the height of the building the roof is going to be difficult to get on. The nails for the felt are also described as being too short. 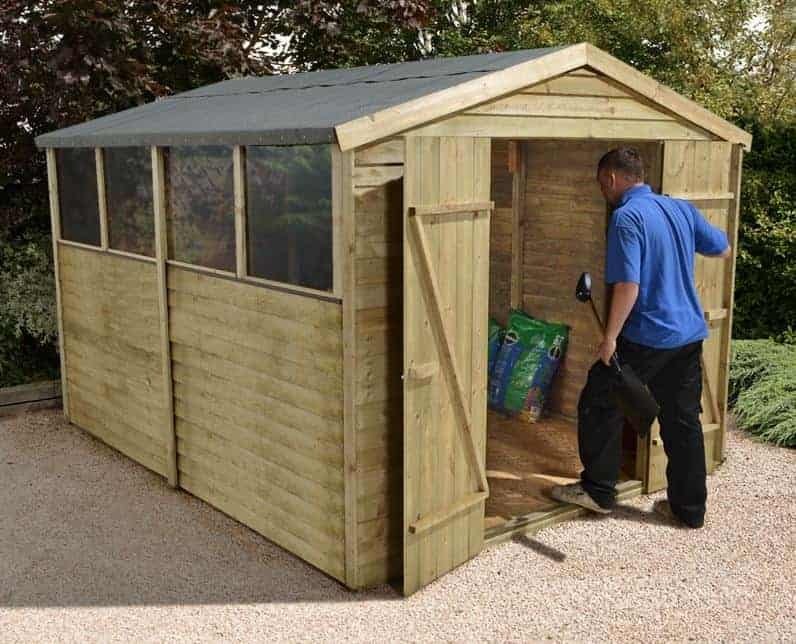 Despite this, Shed Store estimate it should only take around 3-5 hours to assemble. The key advantage of this building is the fact it does not need to be treated. Therefore you are saving a lot of money in the long term. The quality is also excellent whilst the cost is surprisingly low. All in all it is a fantastically priced workshop that gives you awesome value for money. Final Thoughts: This Shed-Plus pressure treated overlap workshop really outshines the majority of its competitors. The walls have been pressure treated by the manufacturer, giving them an outstanding 15 year guarantee against rot. What’s more, this pressure treatment means you do not have to treat the building annually. It doesn’t even require an initial treatment after construction. So if low maintenance is important to you, this could be the perfect workshop for you. It also benefits from wide double doors, a tall design and pressure treated floor joists. A pad bolt is included, but you will need to buy a padlock to prevent anyone from breaking in.